Today is a perfect fall day. The air is crisp, and the leaves crunch beneath each step of hard sole boots. The sun is bright in a periwinkle blue sky, with not a cloud to cross it. Vivid yellows and greens and browns and reds of leaves and grasses color the world around us. The buzz and drum of insects during summer is now lazy chirps, and slow flying bees and flies. Today was the perfect fall day to bring some City Girls to Kreeky Tree Farm. Allan and Chris are preparing for their upcoming Annual Farm Days, October 21 & 22, 28 & 29, and still made time in their schedule to show my nieces, Julie and Garan the life on their farm. I think they just made me a Beloved Auntie with this visit. I was able to get up to the farm a little before Garan and The Girls. They were packing up from the B&B they have been staying at since Saturday for their return trip to Brooklyn before heading back home to Seoul. A missing Pink Bunny Pillow delayed departure. I waited with Allan in their shop filled with bright afternoon sun streaming in through the windows. Chris in the hay loft above us, the rhythm of his feet measuring out steps from the stored hay to the door where he dropped it to the ground below. You hear the birds call to one another, the soft sound of hay fall, and land with a bounce on the other side of the wooden barn door. The shop smells of sweet milk and hay and sunlight. I had time to watch Allan finish canning a batch of Dulce de Leche. I felt like I was 5 again when he asked if I wanted to lick the spoon. Of course I said, "Yes. Thank You!" It was still warm, and it pooled like crème fraîche on my finger. It was silky, and the light vanilla caramel spread as I placed tongue to roof of mouth. Trust me, you want some. It put me in the perfect place for the looks of wonder I would get to see as nieces walked the ground of Kreeky Tree. Elysia is 6, Genvie 3. Elysia loves to be outside, and is fearless. Genevie follows her Big Sister everywhere, wanting to see and do everything Elysia leads her to. The two are a lot to keep up with. Like their mother, Julie did, they are growing up in the big city of Seoul. While they do get to go to the country for family vacations, they are not familiar with farm life in Pennsylvania Country. I had mentioned to Garan that the sounds of the farm were really amazing, and sure enough, even before proper introductions, he was getting his sound gear out. Chris brought Julie and my nieces over to meet Farro the Peacock while Garan got set up. In just a matter of minutes, both girls had grins on their faces that would last the rest of our last day together. Farro lives next to Chris' winter greenhouse. This is his first winter with both the peacock and the greenhouse, so fingers crossed for a good one. We started with the laying hens. There are three separate areas in the primary Chicken Lands. One for large, one for mostly small, and one for the poulet de Bresse. As soon as we entered, it was apparent the girls would follow Allan wherever he led them. He pointed out the roosters from the hens, and told them of their names and personalities, answering every question Elysia posed. Allan showed and spoke of the feeding and watering, and the coops where they lay their eggs. He pointed out the two mobile pens with the meat birds, stating simply that there were birds to lay eggs, and birds to have for dinner. He told us of the chickens who had been there, but who were no longer, and of the foxes and hawks that also live in the woods around the farm. Elysia asked questions, listened to answers, and took it all in. I think we may see a future Veterinarian in the family. Next was the French Quarters, the coop of the stately poulet de Bresse. Elysia wanted to help. She picked up the bucket of feed and made it about half way across the grounds before asking me for help. We took a few more steps, and then I found myself carrying the feed as she ran ahead to catch up with Allan at their coop. There is one main house, with a long run from the side that leads into a spacious, enclosed play pen. 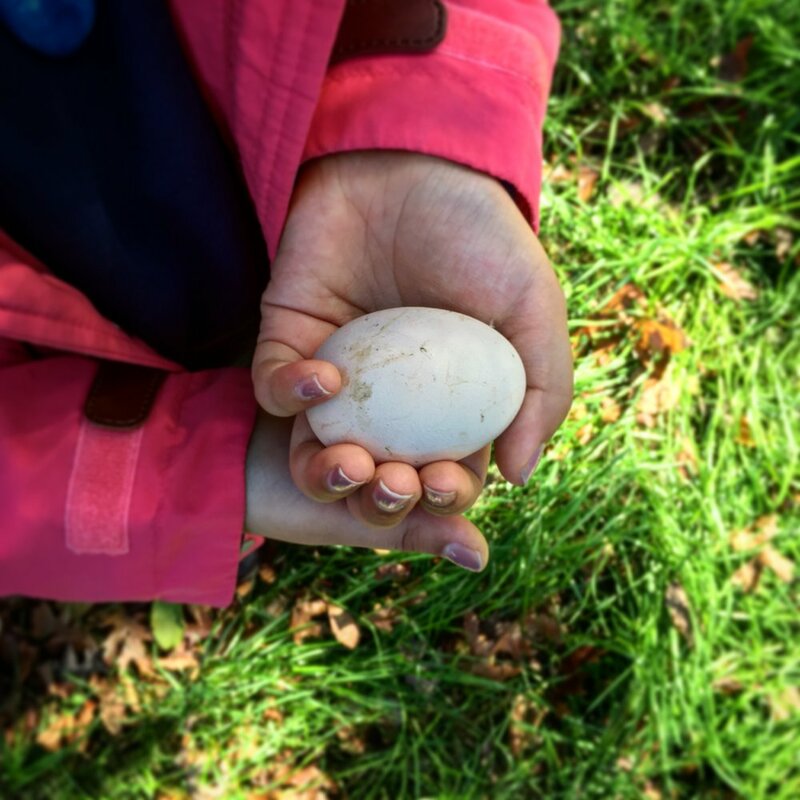 One hen had laid an egg in the center of the pen, and Elysia and Genevie watched all Allan did as he lengthened the run and moved the pen over to a new grassy location. He pulled the egg out and put it into Elysia's hands. She looked up at us all with a grin across her face, and came over to make sure that we each had a chance to inspect the treasure. "It is my first egg," she said, as she lifted her hands high so I could see it good and up close. She handed it back to Allan, who then took us to see the goats. The Girls live in a large area under trees with big spools and a jungle gym that their kids, particularly, love to play on. Millie and Maggie are the eldest, and then there is Pippa. Allan is the one they know best, so it was hard to say who was more curious about whom: The Goats about The Girls, or The Girls about the Goats. All it took to break the ice was a few treats from Allan into the hands of Elysia and Genevie. They were soon looking each other square in the eye, and Elysia even found out where Millie likes to be scratched best, right between her horns. The cat came in, and so it was time to see The Boys. Apparently, Millie Really Does Not Like cats. The large back space has trees for shade and scratching up front, and a wooded area in the back. From under the back trees, were heard Chris call the boys in from the woods. Very soon, we caught sight of the goats running to him. Elysia and Genevie were right up to the fence, all eyes. We stood outside the paddock, watching as Chris was checking the goats for ticks, and Elysia ran out of patience. "Can we go in?" and with that, Allan opened the gate, and we went in. There are four male goats: Pippa's Brother, and Maggie's son, Diablo, and then the two big ones. Target is the Very Big French Donkey, white around his eyes and nose, a dark brown shaggy coat, and really big hooves. There are two other donkeys, the Momma, I think her name is Pearl, and Her Baby, one a creamy white, the other silver and grey. There is the Big Chestnut Horse, Chris' rider, and the brown, very hairy, Ornery Shetland (redundant, I know). I'll get the cast of main characters right by next time, but no time for notes today, and I am just terrible with names. The Goats and the Shetland inspected the children, while the horse and the donkeys gave the cursory glance at the Small Humans in Very Pink Coats. Eysia followed Allan and Chris around each animal, absolutely fearless. They answered all of her questions, and, a six year old little girl from the city has a lot of questions. Genevie hung tough, but she is little, and the Shetland is nosey, and she finally had enough. So did Julie. Once on the other side of the fence, however, Genevie was all about getting her fingers into their coats for a good scratch. The last stop was the chicks in their chicken grow room. It is a small room in the one barn, just big enough for three boxes, feed bags, and two people. We fit four adults and two children to get a good look at it all. The chick boxes are high, because Chris and Allan are tall, so we lifted the girls up to see. Heat lights above, furry little yellow cheepers below. The girls were so happy. It was warm in the room after the chill of outside. It smelled of pine and feed and feathers. It was the close to a remarkable learning experience for Elysia, Genevie, and Julie. It was the close to a remarkable experience for me, to finally meet my nieces and share a day in the beauty of life in our hills. My most heartfelt thanks to the generosity of Chris and Allan, for welcoming us within their life of beauty in our hills. Even as they walked us around the property, they spoke to each other of the work that needed to be done. The donkeys hooves all needed to be trimmed; the meat birds needed to be prepared in the next week, with two batches to follow in the next few coming weeks; Chris needed to work on his garlic, even as he hoped for a few more tomatoes to ripen; Allan had chili sauce to prepare later that day for their Farm Days. KnowYourFarmer is more than an hashtag. It is knowledge that makes you a better person than you were before you knew them. Passion and Beauty. Commitment and Bravery. They are at the heart of every farmer, and luckily, we can bring that to our table and share it with our family.